A streak of orange on the Rue du Rivoli, in Paris bien sur. 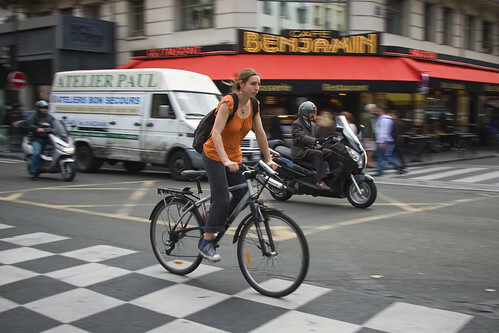 Rivoli is ground zero for establishing bikes in Paris. It's a strategic artery, it's got pedestrians shopping and looking at bikes passing by, it's got a mixed bike/bus lane worth fighting for... so we gotta use it as much as we can while looksing as stylish as possible. Planning on doing my part tonight!